25. Out with the old (Bushwalla) – in with the new (Billy)! We are delighted to announce that our beloved Billy Galewood (formerly known as Bushwalla) is back in the low lands of Holland THIS SUMMER! Even better: He’ll be performing for us twice – debuting his brand-new show “Zero to Billy”, as well as doing an all-music performance of old and new songs of his latest (and last Bushwalla-) LP “Ordinary Tales of Madness”! 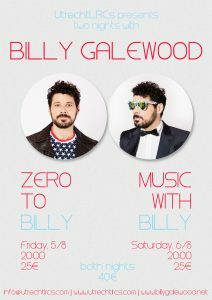 August 5: Get ready for “Zero to Billy”, “an improvisation-based comedy exploration” and experience Billy Galewood as you have never before! August 6: Look forward to “Music with Billy”, an acoustic evening with both songs that we’ve grown to know and love, as well as songs of Billy’s new era!